Sir Henry Charles Husband (30 October 1908 – 7 October 1983), often known as H. C. Husband, was a leading British civil and consulting engineer from Sheffield, England, who designed bridges and other major civil engineering works. He is particularly known for his work on the Jodrell Bank radio telescopes; the first of these was the largest fully steerable radio telescope in the world on its completion in 1957. Other projects he was involved in designing include the Goonhilly Satellite Earth Station's aerials, one of the earliest telecobalt radiotherapy units, Sri Lanka's tallest building, and the rebuilding of Robert Stephenson's Britannia Bridge after a fire. 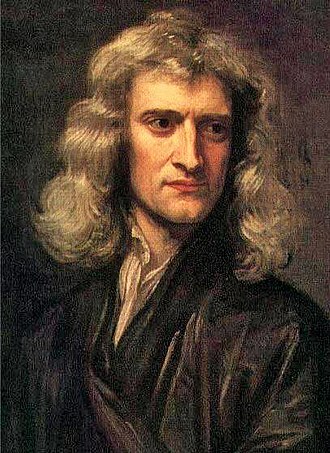 He won the Royal Society's Royal Medal and the Wilhelm Exner Medal. Husband was born in Sheffield in 1908 to Ellen Walton Husband, née Harby, and her husband, Joseph (1871–1961), a civil engineer who had founded Sheffield Technical School's civil engineering department and subsequently served as the University of Sheffield's initial professor in the discipline. Charles Husband attended the city's King Edward VII School and gained an engineering degree at Sheffield University in 1929. His first job was with Barnsley Water Board. He then worked under the civil engineer Sir Owen Williams in 1931–33, before spending three years on various major English and Scottish residential projects with the First National Housing Trust. In 1936, with Joseph Husband and Antony Clark, he founded the consulting engineering firm of Husband and Clark (later Husband & Co.) in Sheffield. During the Second World War, he first worked in the Ministry of Labour and National Service and later on aircraft manufacture for the Ministry of Works. After the war, Husband headed the engineering consultancy, successfully expanding their business, with clients in the immediate post-war years including the British Iron and Steel Research Association, National Coal Board and the Production Engineering Research Association. Husband worked with Bernard Lovell – the founder of the Jodrell Bank Observatory near Holmes Chapel in Cheshire – on the design and construction of the observatory's first large steerable radio telescope, the "250-ft telescope" (now known as the Lovell Telescope). After attempting to adapt military radar equipment to detect cosmic rays shortly after the Second World War, Lovell had realised that a much larger aerial would be required, and constructed a 66-metre diameter dish, limited by being static, before proposing the development of an even larger steerable telescope. The idea posed such formidable engineering challenges that the project had been declared "impossible" by other engineers, but Husband is reported to have concluded at their first meeting in September 1949, "It should be easy—about the same problem as throwing a swing bridge over the Thames at Westminster." He began work on the project early the following year, creating the initial drawings in January 1950 and detailed plans just over a year later. He and Lovell selected a dish diameter of 250 feet (76 metres). Construction began in 1952; despite Husband's optimism the project was beset with delays and escalating costs, caused by multiple changes to Lovell's specifications and the rising price of steel, among other factors. Wind-tunnel studies with a scale model played an important role in the final design. The telescope was eventually completed in 1957, when it was the largest fully steerable radio telescope in the world. It remains in service as of 2016. According to Lovell, the project was completed using "a desk calculator and slide rule", which led to a "sturdy" construction with "quite a lot of redundancy in the steelwork" which Lovell later credited for the telescope's longevity. 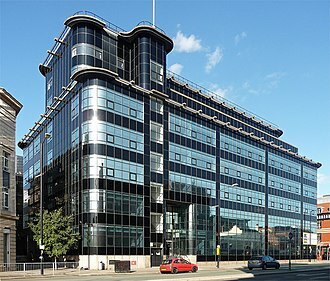 The structure is a rare example of a post-war grade-I-listed structure, denoting its "exceptional interest", and was voted Britain's top "unsung landmark" in a 2006 BBC poll. Husband also helped to design the steerable radio aerials at the GPO's Goonhilly Satellite Earth Station in Cornwall, as well as radio telescopes in the UK and elsewhere. Other innovative projects Husband & Co. undertook under Husband's leadership included designing a facility for testing jet engines at altitude in 1946. In the 1950s, Husband assisted the radiologist Frank Ellis in designing one of the earliest telecobalt radiotherapy units, for radiation treatment of cancer, which was installed at the Churchill Hospital in Oxford. Like the radio telescopes, the engineering problem involved moving a heavy weight, in this case the lead-shielded source, in three dimensions. He designed many road and rail bridges. Husband was awarded the contract to rebuild the Britannia Bridge over the Menai Strait in Wales, after a 1970 fire. The original was an 1850 rail bridge by Robert Stephenson, and Husband faced criticism for designing a double-tier bridge including an additional road deck, which he stated formed part of Stephenson's original concept. The firm also designed the bridge used in the 1957 film, The Bridge on the River Kwai. Outside the UK, Husband & Co. had an office in Colombo and undertook multiple projects in Sri Lanka. 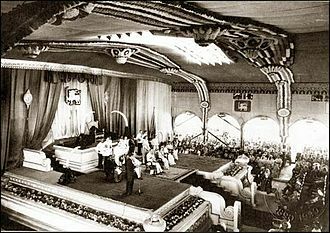 Husband was the architect of the Ceylon Insurance Building in Colombo, Sri Lanka (later Ceylinco House), a 16-storey building equipped with a helicopter landing pad on its roof. On completion in 1960, it was the tallest structure in Sri Lanka, at nearly 55 metres. 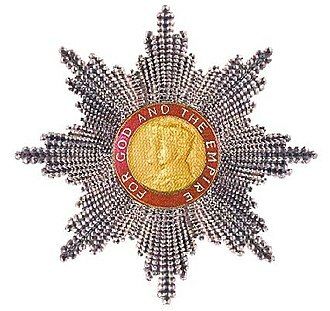 Husband was recognised with the CBE in 1964. 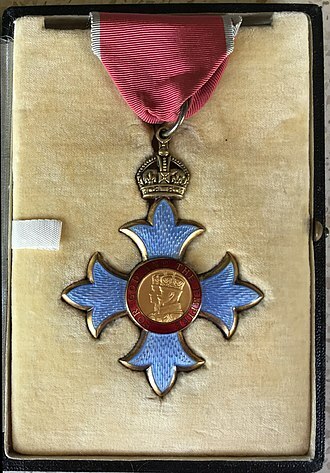 He won the Royal Medal of the Royal Society in 1965 for "his distinguished work in many aspects of engineering, particularly for his design studies of large structures such as those exemplified in the radio telescope at Jodrell Bank and Goonhilly Downs"; he was the medal's first recipient in the applied sciences. He was also awarded the Wilhelm Exner Medal of the Österreichischer Gewerbeverein (1966), the Gold Medal of the Institution of Structural Engineers (1973), and the Benjamin Baker Gold Medal (1959) and James Watt medal (1976) of the Institution of Civil Engineers. He received honorary degrees from the universities of Manchester (1964) and Sheffield (1967). He was knighted in 1975. He served as president of the Institution of Structural Engineers (1964–65), chaired the Association of Consulting Engineers (1967) and served on the board of the Council of Engineering Institutions from 1979 until his death. He also chaired Sheffield University's engineering and metallurgy advisory committee (1962–65) and served on Bradford Institute of Technology's civil engineering advisory board (1962–68). In addition to the Institution of Structural Engineers, he was an elected fellow of the American Society of Civil Engineers, Institution of Civil Engineers and the Institution of Mechanical Engineers, and was among the founding members of the Fellowship of Engineering. In 1932, Husband married Eileen Margaret Nowill (born 1906/7), an architect's daughter who was also from Sheffield. The couple had four children, with the elder of their two sons, Richard Husband, also becoming a civil engineer. He retired in 1982. Husband died in 1983 at Nether Padley, just outside Sheffield in Derbyshire. ^ a b c d e f g h i j k l m n o p q r s t u v w Robert Sharp (2004). 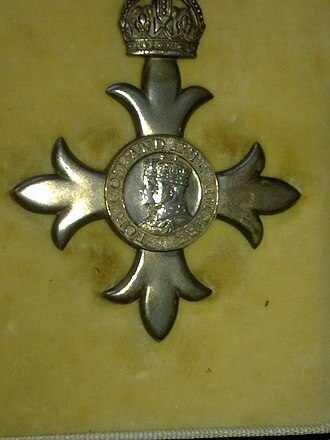 "Husband, Sir (Henry) Charles (1908–1983)". Oxford Dictionary of National Biography. Oxford University Press. Retrieved 17 October 2016. (Registration required (help)). ^ a b c d e f g h i j k l m n o "Husband, Sir (Henry) Charles". Who Was Who (online ed.). Oxford University Press/A & C Black. April 2014. ^ "The Edwardian 1997". Old Edwardians' Association. 18 July 1997. Retrieved 19 October 2016. ^ Ian Morison (26 September 2008). "The 250ft Mk I Radio Telescope". Jodrell Bank Centre for Astrophysics. Archived from the original on 4 March 2016. Retrieved 19 October 2016. ^ a b Jon Excell (1 January 2006). "Pioneer of radar and eminent astronomer Sir Bernard Lovell". The Engineer. Retrieved 15 October 2016. ^ Henry Charles Husband (1958). "The Jodrell Bank Radio Telescope". Proceedings of the Institution of Civil Engineers. 9: 65–86. ^ Kat Harrington (16 November 2015). "The making of Jodrell Bank". The Royal Society. Retrieved 17 October 2016. ^ Ian Morison (9 December 2008). "Construction of the Lovell Telescope". Jodrell Bank Centre for Astrophysics. Retrieved 19 October 2016. ^ a b "Sir Bernard Lovell Telescope, Jodrell Bank Laboratory". Historic England. Retrieved 16 October 2016. ^ Ian Morison (26 September 2008). "The Lovell Telescope". Jodrell Bank Centre for Astrophysics. Retrieved 19 October 2016. ^ "Listed Buildings". Historic England. Retrieved 19 October 2016. ^ Finlo Rohrer (5 September 2006). "Aye to the telescope". BBC. Retrieved 19 October 2016. 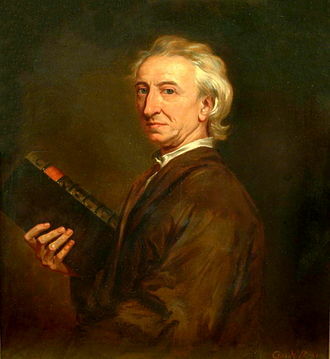 ^ Christopher Paine (20 February 2006). "Frank Ellis". The Guardian. Retrieved 17 October 2016. ^ "Dr Frank Ellis". The Independent. 25 February 2006. Retrieved 17 October 2016. ^ a b c "Sir Henry Charles Husband". Österreichischer Gewerbeverein. Retrieved 17 October 2016. ^ "The Society's Notes". Notes and Records of the Royal Society of London. 21: 80–85. 1966. JSTOR 530822. (Registration required (help)). ^ "Preisträger". Österreichischer Gewerbeverein. Retrieved 16 October 2016. ^ "Past presidents". Institution of Structural Engineers. Retrieved 16 October 2016. The Lovell Telescope /ˈlʌvəl/ is a radio telescope at Jodrell Bank Observatory, near Goostrey, Cheshire in the north-west of England. It was originally known as the 250 ft telescope or the Radio Telescope at Jodrell Bank and it was renamed to the Lovell Telescope in 1987 after Sir Bernard Lovell, and became a Grade I listed building in 1988. 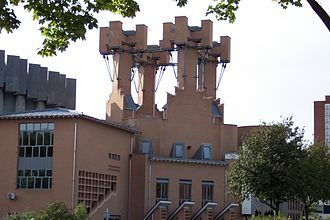 The telescope forms part of the MERLIN and European VLBI Network arrays of radio telescopes, both Bernard Lovell and Charles Husband were knighted for their roles in creating the telescope. In September 2006, the won the BBCs online competition to find the UKs greatest Unsung Landmark. 2007 marked the 50th anniversary of the telescope and it can be seen from the Terminal 1 restaurant area and departure lounges of Manchester Airport. Bernard Lovell built the Transit Telescope at Jodrell Bank in the late 1940s and this turned out to be Charles Husband, whom Lovell first met on 8 September 1949. Two bearing assemblies from 15-inch gun turrets were bought cheaply in 1950, these came from the World War I battleships HMS Revenge and Royal Sovereign, the bearings became the two main altitude rotator bearings of the telescope, with the appropriate parts of the telescope being designed around them. Husband presented the first drawings of the giant, fully steerable radio telescope in 1950. After refinements, these plans were detailed in a Blue Book, which was presented to the DSIR on 20 March 1951, construction began on 3 September 1952. The foundations for the telescope were completed on 21 May 1953 after being sunk 90 ft into the ground and it took until Mid-March 1954 to get the double railway lines completed due to their required accuracy. The central pivot was delivered to the site on 11 May 1954, although the funding was not ultimately made available from the Air Ministry, the planning process had already progressed too far and so this improvement was made anyway. The telescope was constructed so that the bowl could be completely inverted, originally, it was intended to use a movable tower at the base of the telescope to change the receivers at the focus. However, the tower was never built, due jointly to funding constraints. Instead, receivers were mounted on 50-foot long steel tubes, which were inserted by a winch into the top of the aerial tower while the bowl was inverted. The University of Bradford is a public, plate glass university located in the city of Bradford, West Yorkshire, England. The university received its Royal Charter in 1966, making it the 40th university to be created in Britain, there are two campuses, the main campus located on Richmond Road and the School of Management, at Emm Lane. The student population includes 8,395 undergraduate and 2,815 postgraduate students, mature students make up around a third of the undergraduate community. 22% of students are foreign, and come from over 110 different countries, there were 14,406 applications to the university through UCAS in 2010, of which 3,421 were accepted. 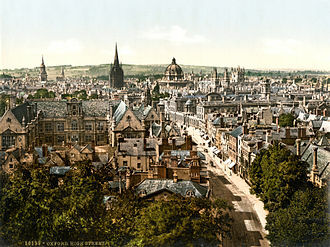 It was the first British university to establish a Department of Peace Studies in 1973, the division has a reputation as a centre of excellence in peace research, international relations, security studies, conflict resolution and development and peace studies. The universitys origins date back to the Mechanics Institute, founded in 1832, in 1882, the institute became the Bradford Technical College. In 1957, the Bradford Institute of Technology, was formed as a College of Advanced Technology to take on the running of higher education courses, construction of the Richmond Building, the largest building on campus, began in 1963. The Horton Building and Chesham building were added, on the opposite side of Richmond Road. 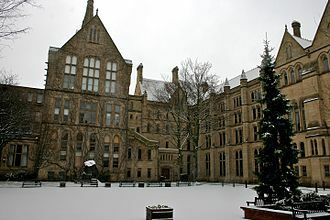 The Charter of Incorporation was granted in 1966, to create the University of Bradford, expansion of the main campus continued in the 1970s and onwards, with the addition of the Library and Computer Centre, Communal Building, Pemberton Building and Ashfield Building. An extension to the Library and Computer Centre was completed in the mid-1990s, in 1996, the university joined with the former Bradford and Airedale College of Health, which became the School of Health Studies within the university. The Department of Physics was closed in the 1980s, the Department of Mathematics has since been reopened within the School of Computing and Media. 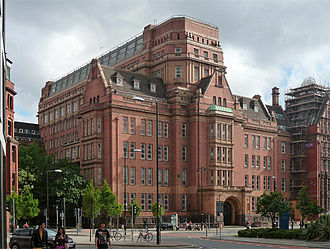 In 1987, the university one of the twelve founding members of the Northern Consortium. 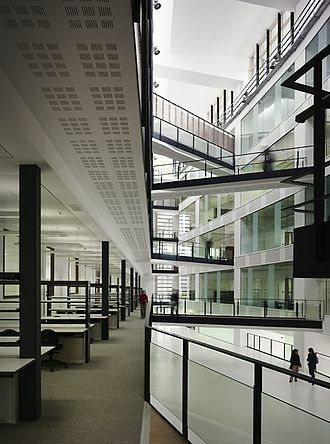 The Mott MacDonald Group is a multidisciplinary consultancy with headquarters in the United Kingdom. It provides engineering and development services internationally, with 16,000 staff in 150 countries, Mott MacDonald is one of the largest employee-owned companies in the world. It was established in 1989 by the merger of Mott, Hay and it has won more than 500 industry awards in the last five years and is among the top ranked firms in the annual league tables published by Engineering News Record and New Civil Engineer. Projects completed by the firm include the Hong Kong International Airport, Mott MacDonald was formed in 1989 through the merger of Mott and Anderson, and Sir M MacDonald & Partners. 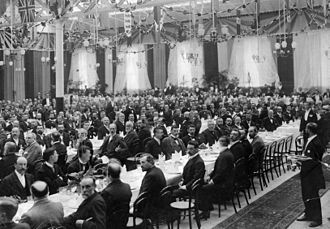 The merger made Mott MacDonald one of the first international engineering, Mott and Anderson was founded as a private partnership between Basil Mott and David Hay in 1902, with the original firm name of Mott & Hay. Prior to forming the partnership and Hay had spent time building London tube railways. Both engineers had worked together since 1888 on the City and South London Railway under Sir Benjamin Baker and Hay employed a young engineer called David Anderson as resident engineer for the latter project. The firm advised on proposals for railways in Sydney, Africa. David Anderson was made a partner in 1920 after returning from army service, the firm was thereafter known as Mott and Anderson. During the 1920s, it designed the bridge over the River Dee at Queensferry, the Tyne Bridge in Newcastle. It designed the enlargement of the City & South London Railway tunnels and their extension past Camden Town, both founding partners died in 1938, at which time most of the construction projects stopped. Sir M MacDonald & Partners was named after Murdoch MacDonald, a British civil engineer and politician, the company formed out of affairs relating directly to British infrastructure development in Egypt between 1890 and 1930, in particular MacDonalds involvement with Aswan Low Dam, starting in 1898. Robert Stephenson FRS was an early railway and civil engineer. The only son of George Stephenson, the Father of Railways, Robert has been called the greatest engineer of the 19th century. 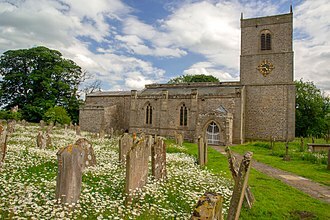 Robert was born in Willington Quay, Northumberland, to George and Frances née Henderson, before moved to Killingworth. Robert attended the middle-class Percy Street Academy in Newcastle and at the age of fifteen was apprenticed to the mining engineer Nicholas Wood and he left before he had completed his three years to help his father survey the Stockton and Darlington Railway. Robert spent six months at Edinburgh University before working for three years as an engineer in Colombia. When he returned his father was building the Liverpool and Manchester Railway and he was appointed chief engineer of the London and Birmingham Railway in 1833 with a salary of £1,500 per annum. By 1850 Robert had been involved in the construction of a third of the railway system. He designed the High Level Bridge and Royal Border Bridge on the East Coast Main Line and he eventually worked on 160 commissions from 60 companies, building railways in other countries such as Belgium, Norway and France. In 1829 Robert married Frances Sanderson who died in 1842, the couple had no children, in 1847 he was elected Member of Parliament for Whitby, and held the seat until his death. He was elected a Fellow of the Royal Society in 1849 and he served as President of the Institution of Mechanical Engineers and Institution of Civil Engineers. Roberts death was widely mourned, and his funeral cortège was given permission by Queen Victoria to pass through Hyde Park and he is buried in Westminster Abbey. Robert Stephenson was born on 16 October 1803, at Willington Quay, east of Newcastle upon Tyne, to George Stephenson and Frances née Henderson and she was twelve years older than George, and when they met was working as a servant where George was lodging. Fanny was suffering from tuberculosis, so George would take care of his son in the evening, in autumn 1804 George became a brakesman at the West Moor Pit and the family moved to two rooms in a cottage at Killingworth. On 13 July 1805 Fanny gave birth to a daughter who lived for three weeks, Fannys health deteriorated and she died on 14 May 1806. Sir Alfred Charles Bernard Lovell, OBE, FRS was an English physicist and radio astronomer. He was the first Director of Jodrell Bank Observatory, from 1945 to 1980, Lovell was born at Oldland Common, Bristol in 1913, the son of Gilbert and Emily Laura Lovell. His childhood hobbies and interests included cricket and music – mainly the piano and he had a Methodist upbringing and attended Kingswood Grammar School. Lovell studied physics at the University of Bristol obtaining a Bachelor of Science degree in 1934, at this time he received lessons from Raymond Jones, a teacher at Bath Technical School and organist at Bath Abbey. The church organ was one of the loves of his life. For his work on H2S Lovell received an OBE in 1946 and he attempted to continue his studies of cosmic rays with an ex-military radar detector unit, but suffered much background interference from the electric trams on Manchesters Oxford Road. He moved his equipment to a remote location, one which was free from such electrical interference. It was an outpost of the botany department. In the course of his experiments, he was able to show that radar echoes could be obtained from daytime meteor showers as they entered the Earths atmosphere and ionised the surrounding air. With university funding, he constructed the then-largest steerable radio telescope in the world, over 50 years later, it remains a productive radio telescope, now operated mostly as part of the MERLIN and European VLBI Network interferometric arrays of radio telescopes. In 1959, he was invited to deliver the MacMillan Memorial Lecture to the Institution of Engineers and Shipbuilders in Scotland and he chose the subject Radio Astronomy and the Structure of the Universe. 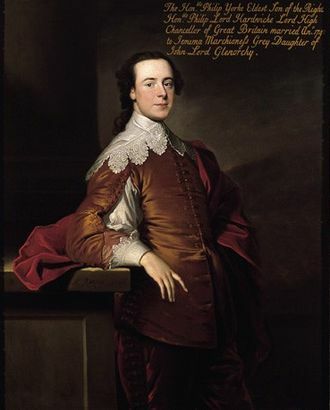 Lovell was knighted in 1961 for his important contributions to the development of astronomy, and has a secondary school named after him in Oldland Common, Bristol. A building on the QinetiQ site in Malvern is named after him, in 2009, Lovell spoke of a claimed assassination attempt in Deep-Space Communication Centre during the Cold War where the Soviets allegedly tried to kill him with a lethal radiation dose. Goonhilly Satellite Earth Station is a large radiocommunication site located on Goonhilly Downs near Helston on the Lizard peninsula in Cornwall, England, UK. The site links into undersea cable lines and its first dish, Antenna One, was built in 1962 to link with Telstar. It was the first open parabolic design and is 25.9 metres in diameter and it is now a Grade II listed structure and is therefore protected. The site has played a key role in communications events such as the Muhammad Ali fights, the Olympic Games, the Apollo 11 Moon landing. The sites largest dish, dubbed Merlin, has a diameter of 32 metres, other dishes include Guinevere and Isolde after characters in Arthurian legend, much of which takes place in Cornwall. The earth station is powered by the National Grid, if power fails, all essential equipment will run off huge batteries for up to 20 minutes, during which time four one-megawatt diesel generators will take over. The nearby wind farm is not part of the complex. Until Easter 2010 the site had a visitor centre inside which the Connected Earth gallery told the history of satellite communications, there were many other interactive exhibits, a cafe, a shop and one of Britains fastest cybercafés. Radiology is a specialty that uses medical imaging to diagnose and treat diseases seen within the body. Interventional radiology is the performance of medical procedures with the guidance of imaging technologies, the acquisition of medical images is usually carried out by the Radiographer, often known as a Radiologic Technologist. 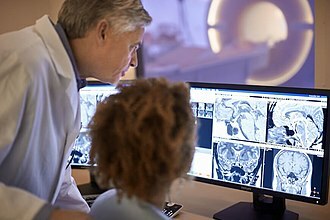 Depending on location, the Diagnostic Radiologist, or Reporting Radiographer, interprets or reads the images and produces a report of their findings and this report is transmitted to the Clinician who requested the imaging, either routinely or emergently. Radiographs are produced by transmitting X-rays through a patient, the X-rays are projected through the body onto a detector, an image is formed based on which rays pass through versus those that are absorbed or scattered in the patient. Röntgen discovered X-rays on November 8,1895 and received the first Nobel Prize in Physics for their discovery in 1901, in film-screen radiography, an X-ray tube generates a beam of X-rays, which is aimed at the patient. The film is developed chemically and an image appears on the film, film-screen radiography is being replaced by computed radiography but more recently by digital radiography and the EOS imaging. In the two latest systems, the X-rays strike sensors that converts the signals generated into digital information, in digital radiography the sensors shape a plate, but in the EOS system, which is a slot-scanning system, a linear sensor vertically scans the patient. Plain radiography was the imaging modality available during the first 50 years of radiology. Due to its availability and lower costs compared to other modalities, despite the large amount of data in CT scans, MR scans and other digital-based imaging, there are many disease entities in which the classic diagnosis is obtained by plain radiographs. Examples include various types of arthritis and pneumonia, bone tumors, congenital skeletal anomalies, mammography and DXA are two applications of low energy projectional radiography, used for the evaluation for breast cancer and osteoporosis, respectively. The Jodrell Bank Observatory is a British observatory that hosts a number of radio telescopes, and is part of the Jodrell Bank Centre for Astrophysics at the University of Manchester. The managing director of the observatory is Professor Simon Garrington, the main telescope at the observatory is the Lovell Telescope, which is the third largest steerable radio telescope in the world. There are three other active telescopes located at the observatory, the Mark II, as well as 42 ft and 7 m diameter radio telescopes and it is reached from the A535. The telescope can be seen when travelling by train, as the Crewe to Manchester Line passes right by the site, Jodrell Bank was first used for academic purposes in 1939 when the University of Manchesters Department of Botany purchased three fields at the site from the Leighs. The site was extended in 1952 by the purchase of a farm from a local farmer, the new land included the site upon which the Lovell Telescope was sited. The first use of the site for astrophysics was in 1945, the equipment he was using was a GL II radar system working at a wavelength of 4.2 m, provided by J. S.
Hey. He originally intended to use the equipment in Manchester, consequently, he moved the equipment to Jodrell Bank,25 miles south of the city, on 10 December 1945. Lovells main topic of research at the time were transient radio echoes, the first staff were Alf Dean and Frank Foden and meteors were observed by the naked eye while Lovell observed the electromagnetic signal on the equipment. Coincidentally, the first time he turned the radar on at Jodrell Bank –14 December 1945 – the Geminids meteor shower was at a maximum. Over the next few years, he accumulated more ex-military radio hardware, including a portable cabin, the first permanent building on the site was located near to this cabin, and was named after it. Today, Jodrell Bank is primarily used for investigating radio waves from the planets, a searchlight was loaned to Jodrell Bank in 1946 by the Army, a broadside array was constructed on the mount of this searchlight by J. Clegg, consisting of a number of Yagi antennas. This was first used for observations in October 1946. Sheffield is a city and metropolitan borough in South Yorkshire, England. Historically part of the West Riding of Yorkshire, its derives from the River Sheaf. With some of its southern suburbs annexed from Derbyshire, the city has grown from its industrial roots to encompass a wider economic base. The population of the City of Sheffield is 569,700, Sheffield is the third largest English district by population. The metropolitan population of Sheffield is 1,569,000, in the 19th century, Sheffield gained an international reputation for steel production. Known as the Steel City, many innovations were developed locally, including crucible and stainless steel, Sheffield received its municipal charter in 1843, becoming the City of Sheffield in 1893. International competition in iron and steel caused a decline in these industries in the 1970s and 1980s, the 21st century has seen extensive redevelopment in Sheffield along with other British cities. Sheffields gross value added has increased by 60% since 1997, standing at £9.2 billion in 2007, the economy has experienced steady growth averaging around 5% annually, greater than that of the broader region of Yorkshire and the Humber. The city is in the foothills of the Pennines, and the valleys of the River Don and its four tributaries, the Loxley, the Porter Brook, the Rivelin. 61% of Sheffields entire area is space, and a third of the city lies within the Peak District national park. The area now occupied by the City of Sheffield is believed to have inhabited since at least the late Upper Palaeolithic period. The earliest evidence of occupation in the Sheffield area was found at Creswell Crags to the east of the city. In the Iron Age the area became the southernmost territory of the Pennine tribe called the Brigantes and it is this tribe who are thought to have constructed several hill forts in and around Sheffield. Gradually, Anglian settlers pushed west from the kingdom of Deira, a Celtic presence within the Sheffield area is evidenced by two settlements called Wales and Waleswood close to Sheffield. The settlements that grew and merged to form Sheffield, date from the half of the first millennium. In Anglo-Saxon times, the Sheffield area straddled the border between the kingdoms of Mercia and Northumbria, after the Norman conquest, Sheffield Castle was built to protect the local settlements, and a small town developed that is the nucleus of the modern city. Antenna of UTR-2 low frequency radio telescope, Kharkiv region, Ukraine. Consists of an array of 2040 cage dipole elements. 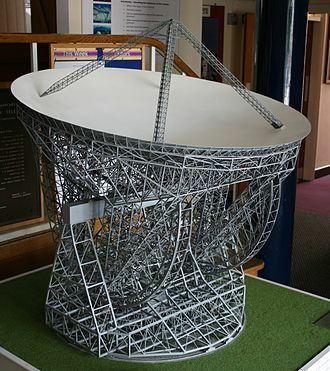 Full-size replica of the first radio telescope, Jansky's dipole array, preserved at the US National Radio Astronomy Observatory in Green Bank, West Virginia. 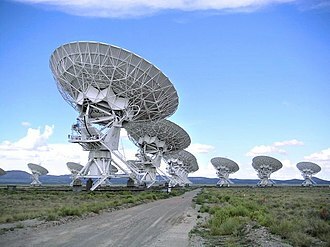 The Very Large Array in Socorro, New Mexico, an interferometric array formed of 27 parabolic dish telescopes. The Mark 1 under construction. Credit: Jodrell Bank. The Lovell telescope mid-resurfacing in 2002. Pioneer 5 mounted to its Thor Able launcher. A section of the original wrought-iron tubular bridge standing beside the modern crossing. One of four Monumental lions that stand at each corner of Britannia Bridge. An 1868 engraving showing Robert Stephenson (seated centre) with the engineers who designed and built the Britannia Bridge. A radiologist interpreting magnetic resonance imaging. Radiography of the knee using a DR machine. Projectional radiograph of the knee. The Menai Strait with the mainland of North Wales to the left and the Island of Anglesey to the right. Thomas Telford's Menai Suspension Bridge. Chandran Rutnam and William Holden while shooting The Bridge on the River Kwai. The bridge at Kitulgala, Sri Lanka, before the explosion seen in the film. 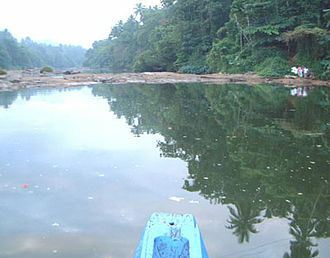 A photo of Kitulgala, Sri Lanka in 2004, where the bridge was made for the film. Historical image showing Gordon Isaacs, the first patient treated with linear accelerator radiation therapy (in this case an electron beam) for retinoblastoma in 1957. Gordon's right eye was removed January 11, 1957, because the cancer had spread. His left eye, however, had only a localized tumor that prompted Henry Kaplan to try to treat it with the electron beam. Patient receiving cobalt-60 therapy in an early teletherapy machine, probably early 1950s. The cobalt is in the radiation head (top center), which produces a beam of gamma rays which penetrate the patient's body and strike the tumor. Radiation passing through the patient is absorbed by the lead shield opposite. During therapy, the head unit rotates slowly around the patient to reduce the radiation dose to healthy tissue. 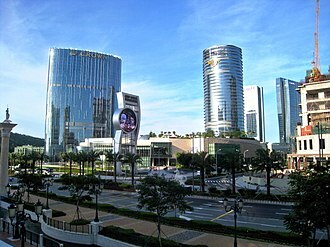 Exterior view of The City of Dreams in Macau in 2009. View of the Manchester Civil Justice Centre from Bridge Street taken in 2008.